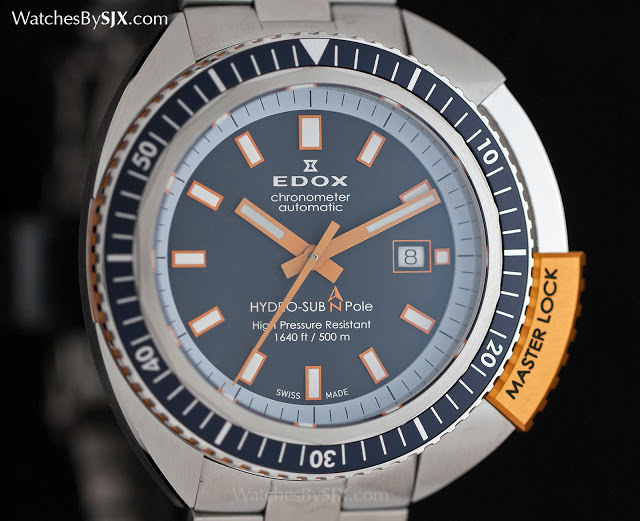 When champion free diver Christian Redl plunged into the waters of the North Pole in a record setting free dive in April 2015, he had on his wrist the Edox Hydro Sub North Pole. 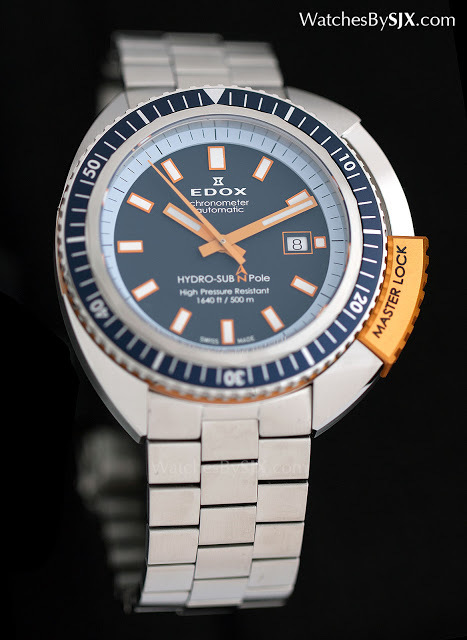 Modelled on an Edox dive watch with the same name from the late sixties, the Hydro Sub North Pole has one striking feature: a large sliding crown protector made of orange anodised aluminium. The case is 46mm in diameter and asymmetric to accommodate the crown protector, which slides upwards to reveal the crown. Rated to 500m, the Hydro Sub North Pole is based on a diver’s watch from the late sixties, and shares the same dial design. The oblong hands and hour markers are characteristic of the late sixties and seventies, with the recent Longines Heritage 1967 remake having the same type of hands. 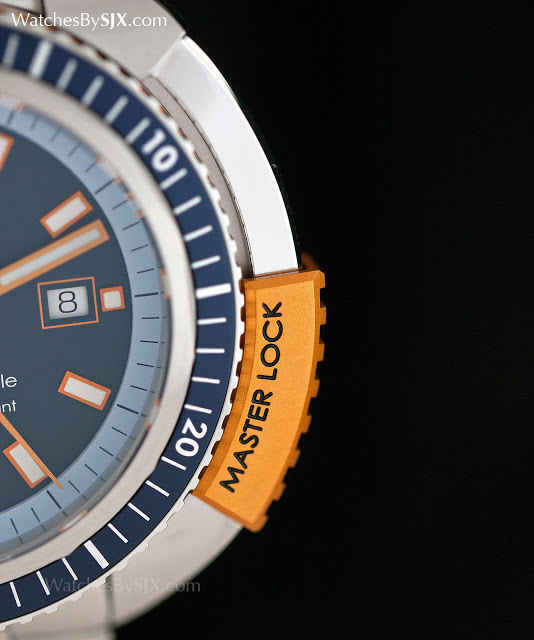 The “Master Lock” crown protector sits on a track along the edge of the bezel, locking into position at four o’clock to cover the crown. 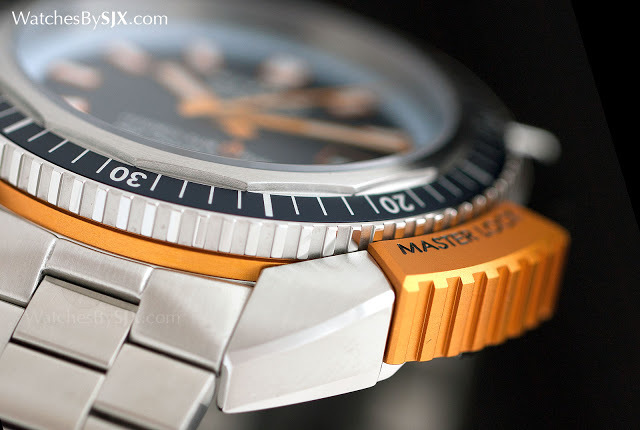 An anodised aluminium ring in the same orange sits underneath the bezel, echoing the orange of the hands and indices. The movement inside is the self-winding Sellita SW200, identical to the ETA 2824, with a power reserve of 38 hours. Austrian free diver Christian Redl had one on his wrist when he went 30m deep into the sea underneath the North Pole on April 13, spending about a minute underwater on just one breath. The watch is delivered on a hefty steel bracelet with a dive extension clasp, though the bracelet is relatively thin compared to the bulk of the case. Included in the presentation box is a orange leather strap as well as a tool to swap the bracelet. 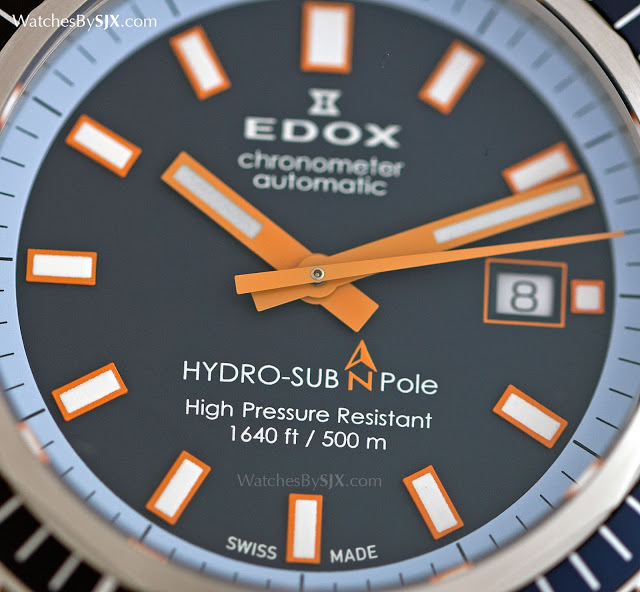 The Edox Hydro Sub North Pole is a limited edition of 350 pieces with a retail price of S$4119 including 7% tax.